Note: As we continue this series, some may want to get started asap. If so, I have negotiated a special deal for ESI Money readers with HostGator. To take advantage of it, simply go to this page then use code “25kBlog” to save a bundle at checkout! Welcome back to our series on five steps to creating a winning $25k blog. 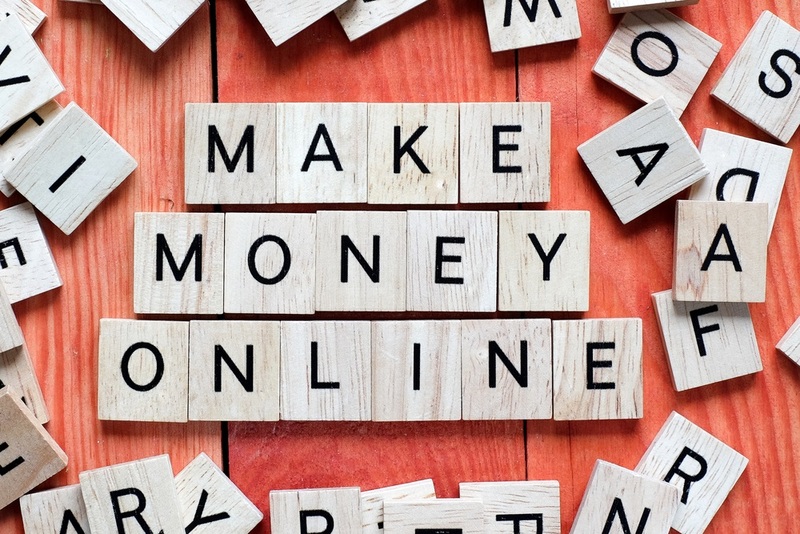 This is our last post and will focus on how to monetize your site. In other words, now that the site is up and running and has reasonable traffic, how do you make money? Revenue – This is the gross dollar amount you make through the various efforts we’ll discuss below. Profit – What you actually take home after all expenses are subtracted. Let’s say you sell $1,000 worth of products. This is your revenue. After you deduct the cost of those products and all your other site-related costs (hosting, photos, email service, etc.) you might be left with $300. This is your profit. In the end, you need to generate enough revenue that covers all your costs and leaves you with a profit. Generally, the higher the revenue the higher the profit, especially in blogging where it gets pretty lucrative once you cover your fixed expenses. There will be a lots of crass commercialism in this post, but before we get to that, let’s review the heart of what it takes to make money. In a capitalist economy, people trade money for things that are of value to them — more value than having the money itself. So in order to make money you need to deliver value to your readers. Some of this comes in the form of your content and some comes by providing them products/services they are interested in buying at prices they find acceptable. In short, you need to create a site where your readers get more out of it than any costs they incur. That said, let’s get to the details of making money with your site. 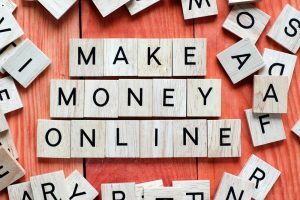 There are probably hundreds of ways to earn money online, but I’m going to stick with the six I see bloggers use most often and which I think can benefit most people reading this. This isn’t a common option and one I don’t really like or recommend. But some bloggers simply ask readers to contribute. Those that do this generally don’t like other revenue-producing options (for whatever reasons) and instead opt to ask readers to donate. I’m not sure how effective this is, but I don’t know of a top money blogger who uses this model. Perhaps there’s one in another industry, but I haven’t run into any. I understand some have philosophical issues with making money off blogs (at least with the suggestions below) and thus prefer to ask for donations. They can do what they want, of course, but if you’re looking to make your site into a business, I don’t think this method will get you far. This is probably the main way most bloggers generate revenue. Advertising pays on a given metric like impressions (in pageviews or sessions), clicks (the number of times someone actually clicks on an ad), or a combination of both. Entry-level advertising. This sort of advertising can be added to your site on day one (and as we covered earlier in this series, I believe it should be). The leader here is Google Adsense. You simply sign up for their program, get approved, then put their code on your site where you want ads to show. Payments are low and ads may be weak (they are supposed to reflect what’s in the content, but often do not), but any site can do this — there’s no traffic requirement to be part of it. Premium display advertising. This is the next step up and usually requires a minimum level of traffic. The big players here are Mediavine (requires a minimum of 25k sessions per month) and Adthrive (owned by CafeMedia — requires 100k pageviews per month). These providers offer better looking, generally national brand-related ads that generate much more revenue than entry-level advertising. I can’t speak for Adthrive but I use Mediavine and saw five times the revenue I did with Adsense with the same traffic. As an example, if you have 25k sessions per month you might make $1,000 monthly with Mediavine but only $200 with Adsense. BIG difference! Privately placed ads. These are even more lucrative because you work directly with the advertiser to place ads. This takes a lot of time and effort though, so only the largest sites (or networks) can afford it. In addition, the premium display ad companies do not allow you to sell your own ads (they take over all inventory), so you better be sure you have enough private ads placed to at least cover what you’d earn with premium ads before you jump ship. So as your site grows, you simply move up from one level of advertiser to another. For most sites, getting to the premium ad level is as high as you need to go. That will give you a firm foundation of earnings, then you can add other money-making options to grow your revenue even more. An affiliate deal, offer, or program is simply an arrangement where you share a product or service and receive a payment when someone makes a purchase. This model was made popular by Amazon though there were likely companies doing it before them. It’s a win for everyone: You get a payment for making the sale, the company gets a sale they might not have otherwise received, and the reader gets introduced to a great product with no extra cost (your fee is paid by the company, not the buyer). All’s fair in love and commerce. The blogger recommends whatever programs pay well and lets readers decide whether they want them or not. Generally the blogger pushes the affiliate offers very hard. Focus on a category. Here the bloggers pick a product category (money, web marketing, food preparation, etc.) that they usually have some sort of expertise in. They then market those products at various levels of intensity. Features select products in moderation. This blogger usually has some sort of criteria for what he offers like “only stuff I use personally” or “only stuff I recommend”. As such, the offerings are fewer in number and are generally offered with personal experience/reasoning rather than a harder sale. Hates the idea of “selling” something. These bloggers don’t like affiliate programs at all. They may feel a bit “slimy” recommending something and then making money off it. You will have to make your own determination of what works for you. One thing to note about affiliate marketing is that the US government requires you to have a disclaimer about your affiliate relationship. The guidelines should include a statement on each post where you include an affiliate ad/link. I’ve seen good success in affiliate marketing. Back in the day when credit cards offered affiliate programs to almost any blogger, I recommended cards I owned and told how to use them to make extra money. Read a lot. You should be reading many blogs anyway to see what’s going on in your niche. When you do, pay attention to the affiliate offers they are promoting. Some might appeal to you. List the products you use. Let’s say you’re a money blogger. Think about the products you use that are money related. Some might be: Vanguard, Personal Capital, Turbo Tax, Quicken, and so forth. Then see if these companies offer an affiliate program. If they don’t, ask if they would consider doing so for you. Join an affiliate group. There are several affiliate companies that host programs for a TON of companies. Some I use are FlexOffers, Impact Radius, and Link Connector. Sign up and search their databases for companies you can recommend. Attend a conference. A lot of conferences have vendor display areas where you can talk to companies that might have affiliate programs. Ask other bloggers. You can go to the Rockstar Finance forums and ask what others are doing to make money from affiliate programs. Use Amazon. Let’s face it, Amazon sell just about everything, right? So if you don’t sign up for any other affiliate program, at least sign up for Amazon. Then use their links when you post about products (such as books). Once your site gets to a certain level of traffic and expertise, affiliate marketing can be an even larger source of income than advertising. I’d recommend getting started with it sooner rather than later. A sponsored post is simply writing about a brand or company in exchange for compensation. The world of sponsored posts can be a little shady, so let me clarify what works and what doesn’t. Hope I found you in a good mood. I’m Sam working as Marketing Manager at Company Deleted. Genuinely, I’m here for advertisement inquiries on your site. At the moment we are focusing on sponsored guest posts for our company’s marketing campaign and We would love to proceed with your site. In anticipation for your favorable response. This is actually a decent one. I sometimes get them addressed to “Sarah” or someone else who is clearly not me. And at least it’s readable. Many are in a language that resembles English only with a bit of imagination. The basics are that this person wants to send you a guest post that contains at least one link to a site he owns or is working for. I can almost guarantee that 1) the content will be terrible, 2) the site is something you do not want to link to, and 3) the payment will be low. The reason people make these offers is because they’re trying to generate links for a specific keyword (or group of words) so a site ranks well in Google. As you might imagine, Google does not like this because it distorts their search results (which they make a lot of money on.) You are basically selling links to game the system. That’s a no-no. Google will either ask you to stop (maybe) or stop you themselves (more likely). How can they do this? Well, if you run Adsense, they could shut you down, which by the way could impact your ability to get approved by premium advertisers. Or they could delete your site from their search engine, basically black-listing you. But even if they don’t do anything like that, you don’t want this sort of post on your site any way. So don’t do it! The type of sponsored post that’s actually legitimate is an arrangement with a real company (one you’re heard of or can easily identify) where they pay you to write an honest review of their product or service. They pay upfront and you give your opinions — good and bad — about them. The following is a sponsored post. All opinions are 100% my own. This lets the readers know that 1) the blogger has been paid for this post and 2) it’s not (supposedly) influencing their review. Personally, I think #2 is true because most bloggers won’t accept a sponsored post from a product or service they don’t believe in. I’ve done several of these over the years. One example was with my former site. Sumo Lounge asked me for a sponsored post. They agreed to send me a $300 bean bag to review and then keep in exchange. I had young kids and they wanted one, so I did it. It was a win-win. Sometimes the arrangements are cash and sometimes they are product. Smaller sites generally get product and larger sites get money (or both). It’s difficult to find these opportunities since there’s no real place they all are listed. So while you might get one now and then, you can’t count on them for a consistent flow of revenue. 5. Develop your own products. This is one of the most difficult money-making ideas to implement. But if it works, it can also be one of the most lucrative. The idea here is to simply sell your own product (ebook, class, etc.) or service (consulting, etc.) on your site. It’s always surprising to see the various products people create and sell online. Some are awesome, some are just ok, some are from big sites, and some from small. There are all sorts of sites at all sorts of sizes selling all sorts of products with all sorts of quality. And many seem to be doing quite well at it. The trouble with this idea is that it generally takes a TON of time to develop. And if it doesn’t sell, you’ve spent a lot time for not much return. You create a class that sells for $199. Your cost of delivery is zero (or close to it). If you can sell one a week, that’s over $5k per year. I don’t have a lot of expertise in this area since it’s not something I’ve done many times. I do have my own quasi-product on Rockstar Finance, but it’s a bit out of the norm for what most sites can develop. Obviously you have to deliver value to your potential buyers. I would want to shoot for multiple times in value versus cost. So if someone paid $10 for my ebook, I would want them to be able to earn or save at least $100 from it, probably much more. You must reach targeted buyers. If your readers are personal finance geeks, producing a cookbook is probably not going to be your biggest selling idea. Uniqueness may be over-rated. I’ve seen multiple products that are very similar and all seem to be doing well. Yes, you need to put your unique spin on a topic, but it doesn’t have to be 100% different than what else is out there. 10% difference seems like enough. Don’t worry about having covered it already. I’ve seen people take content they’ve already written about, package it, and sell it at a good rate. Sure readers might be able to find this info elsewhere on your site (or somewhere on the web) for free, but who wants to spend hours tracking down the content when it’s all in one place. And let’s face it, every single one of the newest, best-selling, money books these days contains tips and tactics that have been around forever. Marketing is vital. Just like in book publishing, creating the product is only half (if that) of the equation. To succeed, you need to be good at marketing it. There are several aspects to this but a few keys are: 1) distribution – you want it in as many places as possible, 2) pricing – you want enough margin to offer great deals to potential buyers and still be able to make a good amount for yourself, and 3) recommendations – the more positive reviews you can launch with, the better. You’ll want a test group to review the product in advance for just this reason. Get others to be affiliates. You can only sell so much yourself. But if you can get 100 other sites to sell one product a week as well, that’s where the really big bucks start rolling in. Do you have a product idea that you think could work well? If you have an event, series, or something else that’s a bit “bigger” than a post, you can get a sponsor for it. An example of this is that Mediavine sponsored this year’s Rockstar Rumble. You can get a sponsor for all sorts of things as long as the environment is right. The key is that you need lots of eyeballs, so this idea only works well when either you have a lot of traffic yourself or you work on a joint project with other bloggers where you all have a lot of traffic collectively. Assuming you hit the right audience with a lot of traffic, you can get companies to sponsor these efforts. That said, this option is out of the realm of reason for most sites and is, at best, an occasional revenue supplement to what else you are doing. Start with advertising. Put ads on your site from day one and get used to monitoring them. As you drive traffic, you can eventually move up to a premium advertiser. Look for a second source of income. Affiliate programs are generally the next-best option, so look for a handful you like/use and can recommend fully. Put some on your site as well as write posts on why/how you use them, tips and tricks, etc. Add as you can. From there, add revenue sources as appropriate. Simply by being a blogger (and especially as you get bigger) you’ll be presented with more and more offers. Test and see what works. You always want to be testing new things. What’s working now may not always work, so you need something on deck in case a current source disappears. You don’t want to become too dependent on any one source of revenue. Things change and you need to be willing to change with them. Otherwise your revenue could go away and you’re left high and dry. Try your own product. If you have an idea you think that could sell well, consider at least preliminary development and testing. You could be sitting on a goldmine. For ESI Money, I have made it up to premium advertising with Mediavine. This alone will earn $25k for me in 2018. I am in the process of testing a few affiliate programs to supplement ad revenue. You never know which ones will work, so I’m trying several. And finally I have a few ideas for products that I may or may not get to. With Rockstar Finance we have a few ads and are trying affiliate offers as well. We also have a few sponsorship opportunities (like the Rumble) plus some additional services (which is our version of our own products) that should do well in 2018. At the beginning of next year I’ll do a summary of how all these net out. That’s it for the series! I’ve probably forgotten a few things I should have included, but 90% of what I know has been contained here. I hope you have enjoyed it and that it’s been helpful. As usual, if you have anything to add, please leave your thoughts in the comments below. This series is a blogger’s dream. Well written and easy to understand step by step from setting up a blog, to creating quality content, traffic and finally monetization. I’d like to add a note on affiliate marketing. Not many people know that I have been an affiliate marketer for many years ( unless you’ve worked with me). A good suggestion will be to look for a start-up company in the financial industry and talk to them about marketing their product. If you believe in the product, talk to them about setting up an affiliate program or form a marketing relationship with them. I did this for a couple of companies, and my results were unthinkable. Thanks, JD for the opportunity to learn from you. This post has some great advice! I know a couple of bloggers who use Strategy #1 with success: The Minimalists and Brain Pickings come to mind, although neither is a PF blogger. I’m also glad to hear your thoughts on burying links into your posts. I have people reach out to me all the time and I never know what to say (I haven’t done it, but now I have a solid reason). Thanks for this series and sharing your wisdom!! You mentioned sponsorships for big events, but had another question related to sponsorships. I noticed that many people have sponors listed on the side bar of their home page and posts. They are usually listed as “gold sponsor” or “silver sponsor” or whatever other gradation they use. This is a single advertiser who pays monthly money (I presume) to sponsor the site. Is this worthwhile or profitable? What are your thoughts? My guess is that these are really privately placed ads and the higher levels 1) paid more and 2) get better placement/space on the site. Yes, they can be very profitable. That’s my understanding. It seems to make sense for my blog niche (high income, mostly medical professionals). There’s clear interest in wanting to try and reach this market. It is appealing because I at least get to pick who and what is being advertised, and can count on the revenue for each month. ESI, nice post! I’m slowly wading back into the blog-o-sphere and will be reading through this series to start getting back up to speed – well done! I appreciate the honesty and the realistic expectations you lay out in this series. It’s getting harder to find posts like these anymore and hope this rises in search so people starting blogs understand very few will be making $100k a month blogging. I’ll be keeping this bookmarked and just wanted to give my thanks! Thank you ESI for an excellent series. I have read many other “how to start a blog” series but none have been as clear and concise as yours. Especially this last post on making money. So many other (mommy, cheerleader style) bloggers really push the make your own product avenue which I am not yet comfortable or confident with. The fact that you as a very successful blogger is not pushing this as no.1 and ‘so easy to do’ means a lot. It reassures me I can start and potentially make money without a resource library or a whole bunch of printables. This has been an incredibly helpful series ESI, what a goldmine of information for both new and experienced bloggers! Thanks for putting so much time and effort into it. I knew most of these sources of income, but had never heard of Impact Radius or Link Connector. My biggest focus right now is working towards reaching that 25k pageviews per month level. Thanks for sharing, ESI. This is great stuff. I see Michelle’s posts and am blown away every time. $1.5M in 2017?!? Man. I’m encouraged you got good value from her affiliate course. I may need to check that out. I just got approached by Radius this past week, so I might be getting somewhere after all. This has been a great series. I don’t currently have enough traffic to truly monetize my site, but this series has been really motivating to me to begin seeing my blog from a more professional point of view. Thanks for putting it together. I will reference it in the future as my site grows. Also, The Minimalists are a good example of a site that uses the donation option to monetize. But I’m with you, not my favorite approach. Great series. It came at an opportune time, as I was already in the planning phase of starting my own blog. When do start worrying about filing taxes as a business? I haven’t accrued much in expenses, but I’m curious when or if I should start that process. You would ask your accountant. I would say “when you start earning money” but there’s always “but this” or “but that” that often applies, that’s why it’s best to check with him/her. Did you go out and hire an accountant when you were just getting started? And a laywer, and bookkeeper, before you were making any real money? Do you have any tips on taking the first steps of starting your business — the paperwork, the taxes, etc? This is the part that stops me from doing anything, because I don’t know where to start with all of that. Not sure what I would need a lawyer for, and I do my own bookkeeping (on Quicken) which there’s not much to. As far as what the rest of the paperwork might be, I’m not sure — do you have some specifics? Once again, ESI, this is very helpful. Thank you. Yeah, Making Sense of Affiliate Marketing sounds like a great course to take. Pardon the ignorance but what is the difference between a session and a page view? In addition to an email service for subscriptions, do you feel it is necessary to have an email with one’s business name (.com) in it? I don’t think you email has to have your site’s name in it. I use a gmail address and many do as well. Amazing, truly. What’s your take on the sponsored post and that you have to say “this post is a sponsored post”? I often get emails about this, but then they say that they do not want any disclaimer. As for as I know, that’s not how Google operates and might get be banned. 1. I don’t do a sponsored post unless it’s stated clearly that it’s sponsored. If someone wants one and doesn’t want me to mention it, I don’t do it. 2. Sponsored posts generally link to a company’s website and are meant to drive traffic to them. The sort of “sponsored posts” you seem to be talking about are companies who want to write a post and use specific keywords linking to their site so they can impact search engine results. As far as I know, Google is ok with the former but not with the latter. If I ever get to that magical 25k sessions a month milestone, I’ll have to check out Mediavine. That’s probably a long way out, since I typically only get 1k – 2k sessions a month. Making money isn’t the goal for my blog, though, it’s just another metric. The main purpose for me blogging is personal development. I’ve enjoyed the blueprint and strategy you’ve laid out in the series. The guest post discussion was very helpful and I hope to deploy some of your suggestions. I have a history with Twitter and really enjoy talking with people there. I also like using it for less generation. I was very surprised by the depth of interaction in the comment sections of fi/fire blogs when I first joined the community. I’m always surprised by the number of comments on personal finance blogs. I’m spending an hour a day in October and November launching TWO websites. One will be brand new and one will peel off posts I’ve been writing for 11 years on my lightly-trafficked personal blog. This series has been a great start. I learned a ton and now have a steady beat to march to as I get things ready. Thanks! Look for femalefinancialinedependence.com and threesentencemoviereviews.com at the end of 2018!